The UO-8 single speed will not be done in time to use it for around town commuting on NAHBS weekend - I've got the fork blades straightened out, but need to get a die to chase the threads on the steerer tube before I send the frame to the powder coater. And Cyclomondo is off line on eBay for the moment. Figure I can ride it for awhile, figure out what works and what doesn't, and make changes accordingly. Then again, it might just stay this way for a long time, and the Peugeot frame may go for something else. Next project is to find a good Sturmey-Archer AW, and lace it up to another Nashbar rim, giving me the choice of single or three speed. Really nice lookin! The wheels came out looking pretty nice to...if you too the decals off you might even mistake em for Weinmann rims at a glance. 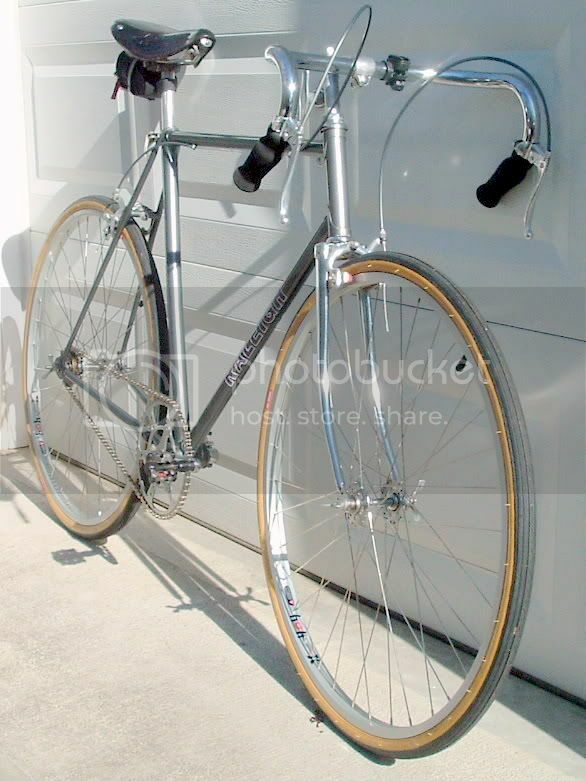 Youve got nearly the exact handlebar setup that I am looking to do on my 3 speed project. What sort of handlebars are those? Love the cottered crankset on there. Thats a beauty. I'm not sure what you'd call them - they're 42mm steel with the usual road bar drop, but not nearly as squared off in the top profile as an average road bar. I'm not sure if I'm going to like them - will find out later today as I get it out for the initial shakedown run. Then again, I have to remember, this bike is being built for inner city errand running and profiling. Not the 20 miles country cruise that I'm about to take it on. I'm already tempering my thinking to not be disappointed when it turns out to be a bit heavier and slower than my "No Dead Kittens" FG/SS. Oh yeah, that crank is also off the Magneet, minus the inner ring. I'm not a huge fan of that bar setup, but otherwise I like it! What do you say about the quality of those rims? Probably worth it for a $20 set. 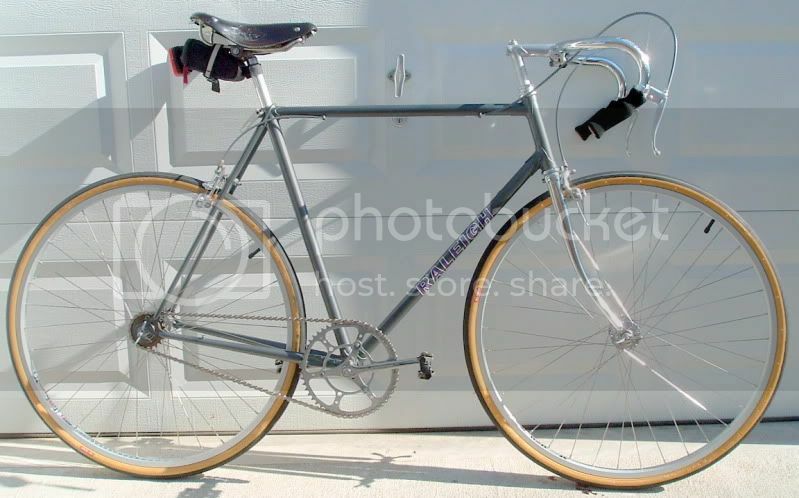 When I decided to put this bike together (both in the original UO-8 incarnation and the current Gran Sport) it was intended as both a practical in-town commuter for lunch hour errands, and, as a deliberately retro bike harking back to the pre- and post WWII era in Britain through the 1950's. Which means, those handlebars and brake levers. If I was just looking for practical, I'd have put on mountain bike bars and brake levers. However, I was looking as much for a style statement as a practical bike. Now, the question will be, how well will I adjust to the bike? Since the early 1970's I've always set my brake levers just at the top of the curve, as I normally ride with my thumb and forefinger curled around the levers with the heel of my hand flat on the bar. I never ride in the drops, even when climbing, and have always wondered why I've run classic road bars on my bikes. I guess it's just because they look 'right'. I can see where there's going to be some serious adjustment when riding in city traffic. Or . . . . . they're going to go away, and I'll settle for 1964 rather than 1944. This is my first experience with the Nashbar rims, and I was impressed with what I got. Nicely straight right out of the box, built up easily, and trued down very nicely. I can see using them again when I need 27" wheels in the future. Wouldn't hesitate to recommend them to someone else needing a good utility rim. Don't get me wrong, I don't DISlike them. I always ride with fingers on the brakes, so I just can't see myself getting used to that one hand position. I believe ordering those rims are the next thing on my list! The UO-8 single speed will not be done in time to use it for around town commuting on NAHBS weekend - I've got the fork blades straightened out, but need to get a die to chase the threads on the steerer tube before I send the frame to the powder coater. Be aware that this particular die needs a 45mm die stock, not the more typical 55mm other fork thread dies use. Yep, it's on my constant watch list, and I'll probably bit on it after the Chesterfield swap meet. I figure all the tools, etc. I'm inheriting from my late father-in-law will take care of the die stock issue. Don't worry, I didn't think you were commenting a dislike. Over the last two days I've knocked out 36 miles in breakdown runs, made a few adjustments, and consider the bike ready to ride. This is going to be an interesting situation, as I'm going to be riding on the drops more than I ever have in the past. What I haven't tried yet is actual urban (read, traffic) riding. I live in the country and don't have all that much traffic which give me some time to get used to the setup. Happily, I think I've got it geared right for climbing (52x20) which was a big worry since I'm presently stuck with that 52 tooth chainwheel. I'm definitely on the drops on a downhill, as I hate to descend without my finger tips on the brake levers. It'll be an adjustment. Hey, they didn't have any problems riding something like this 60 years ago, I can certainly adjust now. Damn, I love how a vintage Raleigh frame handles. And those wheels are turning out to be acceptably light and responsive given the big rims. Definitely go for the rims.